VariAudio can perform extreme pitch correction, rewrite the melody, and extract MIDI from an audio vocal melody. While some might think heavily processed, robotic-style vocals a cliché, in pop and EDM tracks they’re here to stay. There are countless ways of turning your pristine vocal recordings into something obviously synthetic and ‘processed’, but two tactics in particular — overcooking pitch correction, and vocoder-style processing — are great places to start, and Cubase has some wonderful tools for the job. For the ‘Cher meets T-Pain’ sound, the pitch processing must be obviously overcooked, and in Cubase Pro, VariAudio can achieve this: engage VariAudio in the Sample Editor window, select the pitch ‘blobs’ you want to process, and set the Quantize and Straighten controls to 100 percent. The pitch transitions become instantaneous and the pitch-drift of each note will be ironed flat. The results vary with the source material, and with a really well sung phrase, you might find the effect isn’t as ‘obvious’ as you might wish. If so, try splitting any extended blobs into several pieces, then move the shorter blobs to different notes in the same key. 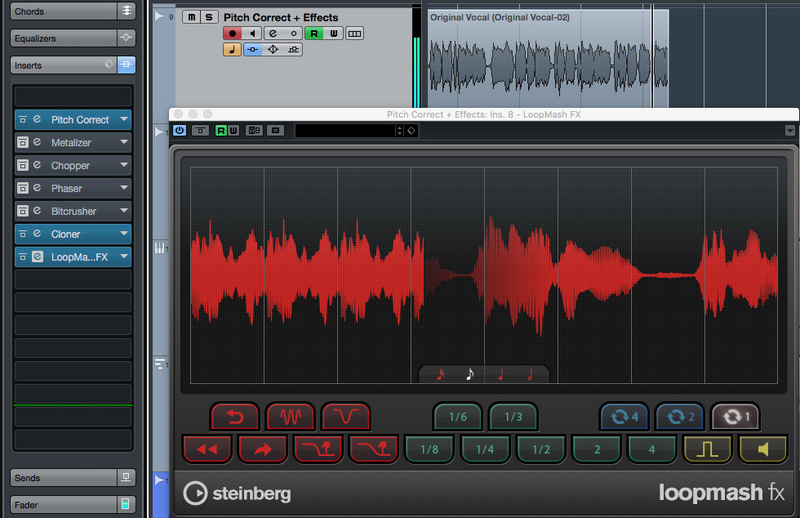 All editions of Cubase include the Pitch Correct plug-in, and this can achieve similar results. Inserted on an audio track, this corrects the pitch in real time. Set the Correction Speed and Tolerance to 100 for the most obvious effect, but you can do more, such as specifying the key/scale for notes to be corrected to. You can also define a Custom Scale — in other words, you can specify your own combination of ‘allowed’ notes, which can result in bigger, more obvious pitch jumps. You can also try the External MIDI Note setting: a MIDI input will be created for the plug-in, and any MIDI track can be routed to Pitch Correct, allowing you to specify the target note using your keyboard or a MIDI clip. Correction is only performed when a MIDI note is received — in the absence of a MIDI input, the original audio is heard, with no pitch correction applied. You can fashion some truly weird and wonderful pitch correction in this way, doing anything from simply ‘correcting’ the occasional note to completely rewriting the melody. Pitch Correct’s target notes for pitch correction can be set by an external MIDI source. This plug-in has more settings you can abuse, too —for example, adjusting the Formant Shift tweaks the size (and, to some extent, the perceived gender) of the voice. This can easily be pushed into unhuman territory for special effects, and the parameter can be automated. 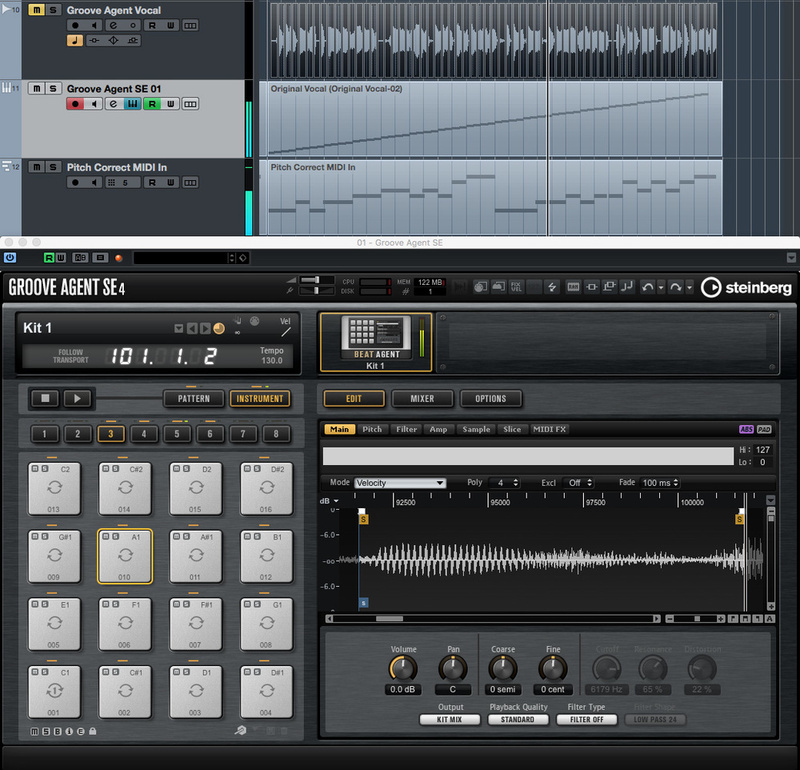 Moving away from the pitch-correction side of things, Cubase’s stock plug-ins provide plenty of dehumanising potential, and Metalizer, Chopper, Phaser, Bitcrusher and Cloner are all well worth exploring. How far to go is down to personal taste, but one tactic is to add a good selection of them, all with fairly subtle settings, and then automate the plug-ins’ bypass in different combinations as the song plays back. This can add useful variety to the vocal ear-candy. 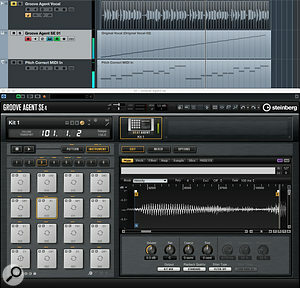 Artist and Pro users can also try inserting the LoopMash FX plug-in. For some real-time glitching, the Stutter, Staccato and Cycle options are well worth experimenting with. And LoopMash FX can, in the same way as Pitch Correct, be controlled via a separate MIDI track. Don’t overlook Cubase’s stock plug-ins — they offer plenty of scope for vocal mangling. Both Chopper and LoopMash FX provide options for slice-like glitching, but if you add Groove Agent SE4’s (GA SE4) loop-slicing into the mix you can take your vocal mangling much further — it allows you to ‘play’ your vocal via MIDI in very interesting ways. The first step is to slice your vocal phrase. You can do this manually, but selecting the Split tool and Alt-clicking on the clip will split it as per the current Quantize setting; if in doubt, try eighth-note divisions. To get these slices into GA SE4, open an empty instance of GA SE4, select all the vocal-clip slices, and drag them to an empty GA SE4 Instrument pad (for example, C1). The slices will be mapped sequentially across the MIDI pads (in my eight-bar example, from C1 to D6). These pads can be triggered by playing the relevant note on your MIDI keyboard. But switch to the instrument’s Pattern panel and you’ll see that the drag/drop of the slices automatically puts a pattern on one pad. This triggers each slice in turn, thus playing the whole original vocal phrase. For now, use the MIDI Export button (to the right of the Pattern page) to drag and drop the pattern onto the GA SE4 Instrument track as a MIDI clip. Having sliced your vocal (top track) and dragged it into GA SE4, you can replay the slices via MIDI (middle tack) and, via the Pitch Correct plug-in, control the pitches of each slice (bottom track).There are now two lots of MIDI we can edit (or play in real time) to give us creative control over our vocal phrase. The MIDI clip on the GA SE4 track can be edited to glitch the phrasing of the syllables/words (based on the slices on GA SE4’s pads), while the Pitch Correct MIDI track can be used to control the pitch of each slice. There’s a huge amount of fun to be had here, in ‘re-phrasing’ the sung words, changing the pad/slice order, shortening the MIDI Notes used to trigger each pad (for a cool stutter effect), re-pitching the original melody, reversing slices on particular GA SE4 pads — or all of the above! And, of course, any other insert effects can be applied too. For a more obvious ‘glitchy’ effect, adjust GA SE4’s Amp settings for each pad to create a fade in. You can do this kind of edit for each pad individually, but this can take quite a while, so why not try selecting a range of pads? Holding the Shift key, click on one pad and then on another. All pads between these two are selected, and any edits will be applied to all selected pads. The different Amp envelope modes are also worth playing with, as each gives a different result. You might also experiment with GA SE4’s filters. If you’re prepared to get stuck in with detailed audio editing, Cubase offers plenty more options for generating heavily processed, robotic vocals. But using MIDI to control the ‘performance’ of your processed vocal phrase is so intuitive and so versatile — the approaches described here can take you a long way. I’ve created a number of audio examples to accompany this article, all contained in a single ZIP file.